JanelOnline.com: What are the Advantages of using Kester Flux when Soldering Components on a PCB? What are the Advantages of using Kester Flux when Soldering Components on a PCB? 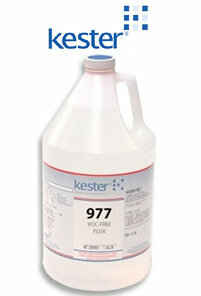 We recently had a customer ask us what the advantage was for using Kester Flux when soldering components on a PCB. They also wanted to know how flux is supposed to be used. So in case any of our other readers were wondering, we decided to take some time and discuss this topic. For starters, one of the main purposes of Soldering Flux (as well as acting as a surfactant), is that it cleans the oxidized residue off of metal and protects the bar metal during soldering. Soldering Flux is exceptionally useful as without flux such as Kester Solder Flux, the user would be trying to solder to copper or tin oxide, and the heat would be making the oxide layer thicker as it is a natural of metal when it combines with oxygen in the air. It is often useful to apply extra flux in the application, especially if the user is needing to make a joint quickly - as it reduces the risk of damaging a component. With this said, Kester Flux Pens are often the easiest way to do this - in that a user can simply wipe the flux pen across the area to be joined and then quickly solder. Additionally, Soldering Flux is considered to be essentially impossible when soldering fine pitch components such as TQFP. 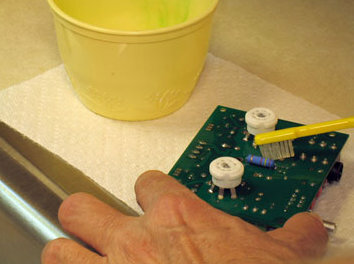 You can clean your PCB after soldering with Flux Remover (the purer the Isopropyl Alcohol in the Flux Remover, the less chance for less over residue and 99.8% is the purest available) and a brush, cotton or foam swab, or any other soldering cleaning method. Following, use a can of Techspray Pressurized / Compressed Air and blow it dry. However, the best recommendation is to clean the printed circuit boards after manual soldering is to use an ultrasonic machine. Essentially the user should remove the Soldering Flux so debris will not stick to the circuit boards later and cause shorts. It also removes splashes of solder and any other residue which then allows the user to see if they left any unwanted debris on the boards. The less left on the board, the better as it reduces the chance for shorts. What about you? What is your best method to remove solder flux from a PCB? If you have a question about what flux remover or Kester flux to use contact us today. Accordingly, the client may just need to watch 30 minutes to a hour of tape as opposed to 8 hours or a greater amount of static chronicle.